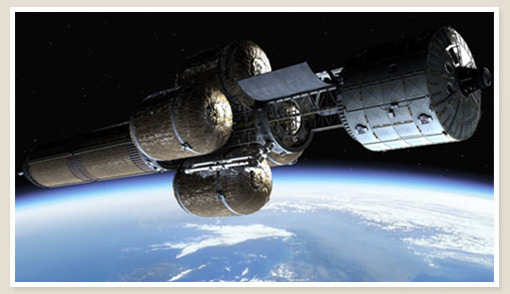 Project Olympus is the mission depicted in the Race to Mars expedition miniseries, set in the year 2030. The following details apply to that particular mission, designed in consultation with teams of top scientists and researchers. Other proposed mission-designs vary in timeline, duration of surface stay, mission-trajectory, mission objectives, propulsion-types, etc. The Race to Mars mission represents the best efforts of our science-advisory team based on technological, scientific, political and socials projections for the first human Mission to Mars– but we of course acknowledge that this is one vision among many. Care to differ? Please take part in discussions on our Community Message Boards. When do the crew wear spacesuits? With a Venus fly-by on the way, it will take about 11 months to get to Mars. Once there, the crew will spend two months on the surface, exploring, drilling for water and conducting experiments. The return trip, which will be more direct, will take six and a half months. By the end of the mission, the crew will have traveled 900 million kilometers, spending 19 months in space (just over 1.5 years). They will be the first humans to experience first-hand a close view of planet Venus, and the first humans to walk on the surface Mars. Their observations will greatly advance our knowledge of these planets. Their overriding goal will be to finally provide conclusive evidence to answer the longstanding questions of whether there is life on Mars. Because this is a complex mission, it will occur in stages, beginning with the launch of cargo vehicles carrying the Mars surface habitat, Mars ascent/descent vehicle (lander), surface-exploration rovers, a drilling rig, surface power reactor and other supplies. The Terra Nova Crew Transit Vehicle will be assembled in space and parked in low Earth orbit awaiting the arrival of the crew on board the Earth Return Capsule. Performs more efficiently than chemical propulsion systems. Can multitask by also providing electrical power for the crew-habitat. Simplifies operations, therefore reducing mission mass and risk. One example of how BNTR reduces risk involves arrival at Mars: many robotic missions aerobrake and capture into Mars Orbit by skimming across the surface of the Martian atomosphere. A slight variation in angle, and the craft can skip off the atmosphere and back into space (or burn up on a premature entry). BNTR propulsion allows the Terra Nova to do a propulsive capture – firing the engines in order to slow down and precisely enter orbit. Easily integrates with artificial gravity systems. Reduces the amount of fuel required (as compared to chemical propulsion), which in turn makes the mission more affordable. Once the crew has boarded the Terra Nova, they will begin their journey towards Mars by initiating a number of “burns,” to get on the right trajectory to Mars and later to enter and leave Mars orbit. To create a burn, the rocket propulsion system is fired. Rocket thrust, which propels a spacecraft through space, is created by the rapid release of exhaust gases. The Terra Nova uses a bi-modal nuclear thermal rocket for main propulsion and for electrical power. This mission will involve a number of critical burns, beginning with two initiating the Trans Mars Injection, which will set the Terra Nova’s course towards Mars. Later, a burn will allow the Terra Nova to capture Mars orbit. Once the surface expedition on Mars is complete, the Terra Nova will use a burn to enter the trajectory towards Earth. Even though the astronauts will be in microgravity during critical points of their mission, including burns, artificial gravity is possible, making it more comfortable and less of a health risk for the crew during their long mission. After a burn is complete, the crew will be able to initiate a spin up of the Terra Nova, using the Reaction Control System thrusters. The ship turns sideways to the direction of motion and begins to rotate, until it is traveling like a propeller. This creates centrifugal force that in turn creates artificial gravity. It takes 40 minutes to achieve a rotation speed of 4.5 RPM, which generates an artificial gravity that’s only 30 percent weaker than that of Earth’s. Flying past Venus is not only a way for the Olympus crew to experience an incredible planetary view, it’s also a way to save fuel. A gravity ‘slingshot’ maneuver can change trajectory (speed/direction of motion), so veering towards Venus and into its gravitational field will cause the crew’s spaceship, the Terra Nova, to turn towards Mars without needing to use as much fuel. Although the outbound journey (with the Venus fly-by) will take 11 months compared to the return journey (without Venus fly-by) which will only take 6, the reduced energy requirements for the mission will be significant. And the less fuel you need to haul out from Earth with you, the cheaper the mission. The Venus fly-by was a successful route for the Mars-bound Mariner 2 in 1962. Some equipment for the mission will be sent ahead in separate cargo-vehicles, while some will travel along with the astronauts in their Crew Transit Vehicle. Gagarin The Mars Ascent/Descent Vehicle (MADV), which will bring the crew from orbit around Mars to the surface of the red planet, and back again when the surface-mission is completed. There will also be the Crew Transit Vehicle, the Terra Nova, which will bring carry the crew to Mars and home again. The Terra Nova carries six astronauts from Earth orbit to Mars orbit.